The evolution of the largest structures in the Universe are here simulated in this stunning video created on the NASA AMES' constellation of supercomputer processors. This Bolshoi simulation (based on the Lambda Cold Dark Matter model) is designed to study how dark matter halos evolved. Violent Climate Change on an Alien Planet –A First! Astronomers using the NASA/ESA Hubble Space Telescope have witnesseda dramatic changes in the upper atmosphere of a distant alien planet. 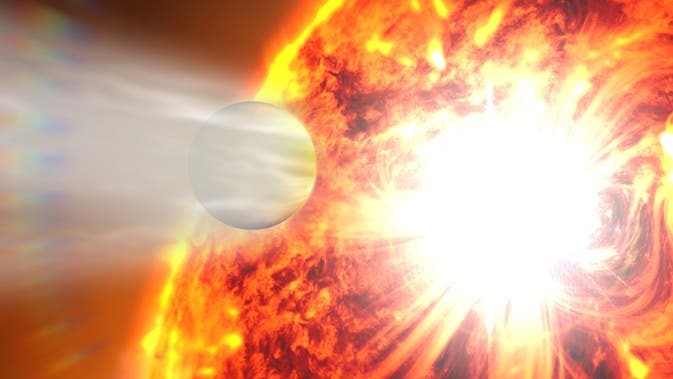 Just after a violent flare on its parent star bathed it in intense X-ray radiation, the planet's atmosphere gave off a powerful burst of evaporation. The observations give a tantalizing glimpse of the changing climates and weather on planets outside our solar system. Jean-Michel Alimi from the French National Centre for Scientific Research (CNRS) and colleagues from the DEUS consortium, created a model of the evolution of dark mattter that covers 90 billion light years, which is the size of the universe that we are able to see, and follows 550 billion particles the mass of our Milky Way. The Helix Nebula is one of the closest and most remarkable examples of a planetary nebula. It lies in the constellation of Aquarius (The Water Bearer), about 700 light-years away from Earth. This strange object formed when a star like the Sun was in the final stages of its life. Unable to hold onto its outer layers, the star slowly shed shells of gas that became the nebula. It is evolving to become a white dwarf star and appears as the tiny blue dot seen at the centre of the image at bottom of the page. In 2011, astronomers using ESO’s Very Large Telescope have discovered a gas cloud with several times the mass of the Earth accelerating fast towards the black hole at the center of the Milky Way. This was the first time ever that the approach of such a doomed cloud to a supermassive black hole has been observed. “The idea of an astronaut close to a black hole being stretched out to resemble spaghetti is familiar from science fiction. But we can now see this happening for real to the newly discovered cloud. It is not going to survive the experience,” explains Stefan Gillessen (MPE) the lead author of the paper. During a 20-year program using ESO telescopes to monitor the movement of stars around the supermassive black hole at the centre of our galaxy (eso0846), a team of astronomers led by Reinhard Genzel at the Max-Planck Institute for Extraterrestrial Physics (MPE) in Garching, Germany, discovered a unique new object fast approaching the black hole. Over the last seven years, the speed of this object has nearly doubled, reaching more than 8 million km/h. It is on a very elongated orbit and in mid-2013 it will pass at a distance of only about 40 billion kilometres from the event horizon of the black hole, a distance of about 36 light-hours. This is an extremely close encounter with a supermassive black hole in astronomical terms. This object is much cooler than the surrounding stars (only about 280 degrees Celsius), and is composed mostly of hydrogen and helium. 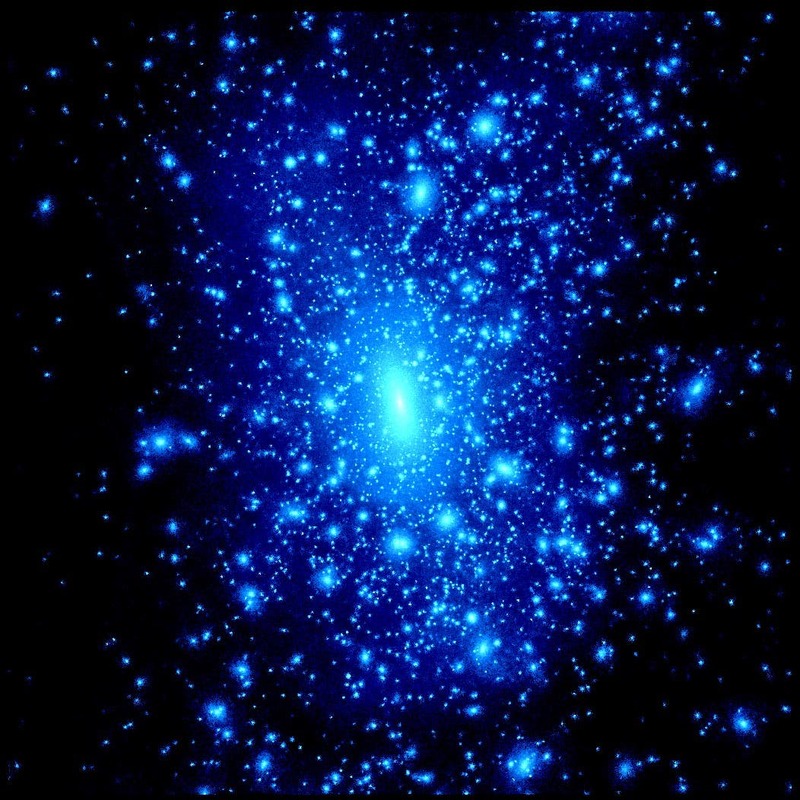 It is a dusty, ionised gas cloud with a mass roughly three times that of the Earth. The cloud is glowing under the strong ultraviolet radiation from the hot stars around it in the crowded heart of the Milky Way. The current density of the cloud is much higher than the hot gas surrounding the black hole. But as the cloud gets ever closer to the hungry beast, increasing external pressure will compress the cloud. At the same time the huge gravitational pull from the black hole, which has a mass four million times that of the Sun, will continue to accelerate the inward motion and stretch the cloud out along its orbit. The cloud’s edges are already starting to shred and disrupt and it is expected to break up completely over the next few years. The astronomers can already see clear signs of increasing disruption of the cloud over the period between 2008 and 2011. * The material is also expected to get much hotter as it nears the black hole in 2013 and it will probably start to give off X-rays. There is currently little material close to the black hole so the newly-arrived meal will be the dominant fuel for the black hole over the next few years. One explanation for the formation of the cloud is that its material may have come from nearby young massive stars that are rapidly losing mass due to strong stellar winds. Such stars literally blow their gas away. Colliding stellar winds from a known double star in orbit around the central black hole may have led to the formation of the cloud. This research was presented in a paper “A gas cloud on its way towards the super-massive black hole in the Galactic Centre”, by S. Gillessen et al., that appeared in the 5 January 2012 issue of the journal Nature.